Chives have been in cultivation since at least the Middle Ages in Europe, and there are references to their use in ancient Rome, but primarily as a medicinal herb. They were used to treat sunburn and sore throat, and it was believed that they would increase blood pressure and act as a diuretic. As a culinary herb, they did not really catch on until the late 18th century. Bundles of dried chive flowers and leaves were hung in some central European households to ward off evil spirits. Chives are, of course, small members of the onion family, Alliaceae. They share many physical traits with onions, including the hollow, tubular leaves, the bristled flowers, bulbous roots, and overall flavour. Chives are classed into two groups — onion chives and garlic chives. Both are grown for their leaves and edible flowers rather than their bulbs. 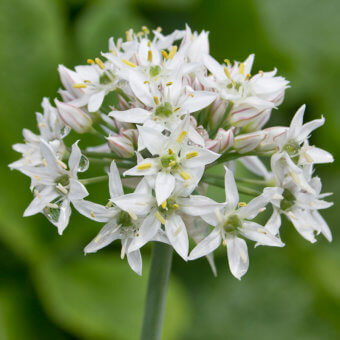 The latter tend to have flattened leaves and white flowers, whereas onion chives have distinctive pink flowers with tubular petals. The word “chives” comes the Latin word cepa (meaning “onion”), via the French cive. The species name shoenoprasum is derived from Greek, meaning essentially “sedge leek,” referring to the almost grassy growth form. Garlic chives, in Chinese and other Asian cuisines, are held in higher regard than onion chives are in the West. There is, at least, a greater appreciation of their potential as an ingredient in stir-fries, soups, and other meals. In Chinese cuisine, garlic chives are treated as a vegetable, rather than sparingly, as a herb. The leaves are used fresh and green, but they are often blanched — grown in the dark to disrupt photosynthesis, which produces “yellow chives.” The unopened flower buds are also used, and are more expensive as an ingredient. Like their cousin, garlic, chives contain relatively high levels of organic sulfur compounds, which give them their aroma and flavour and make them an important companion plant. The small clumps they form are easily manageable, and can be grown between rows of other vegetables. 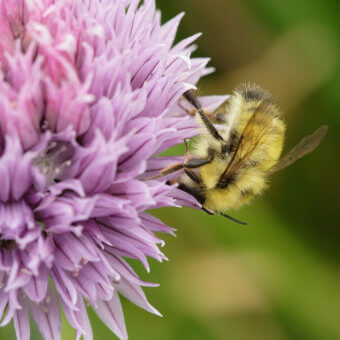 The scent of chives repels many insect pests, such as the Japanese beetle, but their flowers attract masses of wild and domestic bees and other pollinators. Even hummingbirds seem to like chive flowers. Juice from the leaves of chives have been used to fight fungal infections, mildew, and scab on other vegetables. Chives are perennial. They will grow in clumps, with small bulbs at the bases of each leaf set, and these bulbs are attached by a rhizomatous root that spreads very slowly, horizontally beneath the surface of the soil. Chives are hardy to Zone 3, but will die back in harsh winters, emerging in the spring. In south coastal B.C., they may be harvested all winter long in sheltered areas. Chock full of vitamins A and C, chives match beautifully with eggs, potatoes, fish, and soups. Chives in savory crepes are unbelievable tasty. Along with chervil, tarragon, and parsley, they are essential to the French fines herbes, often added to dishes in a muslin bag, which can be removed before serving. Difficulty: Easy. Great for containers. Timing: Start seeds indoors 8 weeks before the last frost or direct sow in containers or straight in the ground. Starting indoors allows you to control the size of the initial clump, and gives the plants a bit of time to develop before harvests begin in mid-summer. Sowing: Sow as any other onions — three seeds to a cell, or lightly covered with soil in larger pots or outdoors in spring. Soil: Tolerant of a wide range of soils, but loose, well-drained, fertile soil is best. Aim for a pH of 6.0-7.0. Growing: Grown outdoors, chives need almost no attention except in very hot, dry weather, when they should be kept well-watered. If growing in containers, clumps will need to be broken up and transplanted on each spring or fall. Harvest: Cut as needed, but cut all the way to the base of the stem. Chives will continuously grow back new leaves, and one large clump in the corner of the garden will suffice for most households. Storage: Do not bother trying to dry chives, as they tend to turn to flavourless dust. Rather, treat like basil — chop the chives and freeze them with water in ice cube trays. The cubes can be stored in bags or other containers in the freezer until needed. Chives can be freeze-dried particularly well, but must be kept out of the light or they will deteriorate rapidly. Seed info: The ideal temperature for germination is 15-20°C. Chive seeds, like all onion seeds, are not long-lived, but fresh seeds should germinate evenly. Growing for seed: This is very simple, as the seeds are abundant and easy to shake free from the flower heads. Chives do not cross-pollinate with other Allium species. Pests & Disease: Almost trouble free. Once established, chives will take care of themselves. Companion Plants: Grow chives near or between rows of any vegetable that requires pollination by insects. Chives may help to repel aphids and white flies.